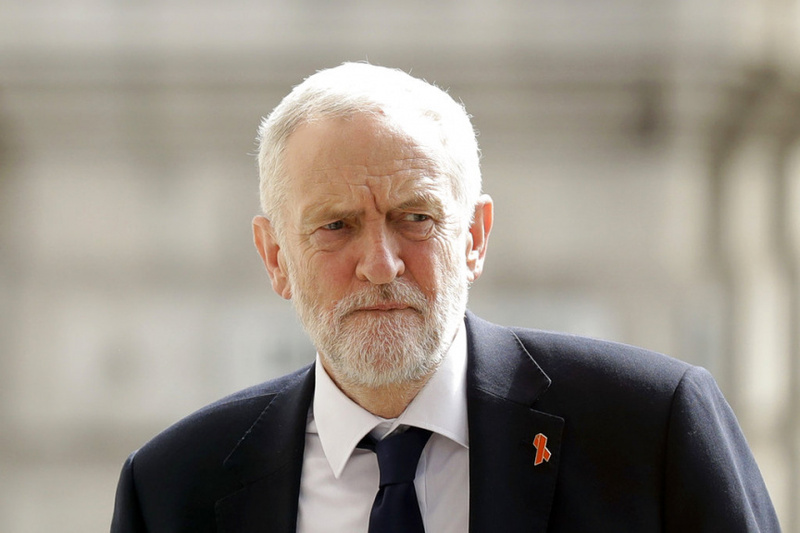 LONDON (AP) — British opposition leader Jeremy Corbyn, who is facing allegations of enabling anti-Semitism, acknowledged Monday that he was present at a wreath-laying to Palestinians allegedly linked to the murder of 11 Israelis at the 1972 Munich Olympics. But the Labour Party leader said "I don't think I was actually involved" in laying the wreath. The left-wing politician — a longtime critic of Israel's treatment of Palestinians — has been facing mounting criticism since the Daily Mail published photos of Corbyn holding a wreath in a Tunis cemetery in 2014, near what the newspaper said were graves of Black September members. The Palestinian militant group carried out the kidnapping and massacre at the Munich games. Several members were later killed by Israel's Mossad intelligence agency. Corbyn has previously said he was at the cemetery to commemorate the victims of a 1985 Israeli air attack on Palestinian Liberation Organization offices in Tunis. On Monday, he acknowledged a wreath had also been laid to "those that were killed in Paris in 1992." PLO official Atef Bseiso, whom Israel has accused of helping to plan the Munich Olympic attack, was gunned down outside a Paris hotel that year. "I was present when it was laid. I don't think I was actually involved in it," Corbyn told reporters. "I was there because I wanted to see a fitting memorial to everyone who has died in every terrorist incident everywhere because we have to end it." The statement is unlikely to quell criticism from Jewish groups and Labour members who say Corbyn has allowed anti-Semitism to spread in the party. "Being 'present' is the same as being involved. ... Where is the apology?" tweeted Labour lawmaker Luciana Berger. Israel Prime Minister Benjamin Netanyahu tweeted that "the laying of a wreath by Jeremy Corbyn on the graves of the terrorist who perpetrated the Munich massacre and his comparison of Israel to the Nazis deserves unequivocal condemnation from everyone — left, right and everything in between." Corbyn responded on Twitter that Netanyahu's "claims about my actions and words are false." The Labour Party said Corbyn "did not lay any wreath at the graves of those alleged to have been linked to the Black September organization or the 1972 Munich killings." Corbyn has been accused of failing to expel party members who express anti-Semitic views and has received personal criticism for past statements, including a 2010 speech in which he compared Israel's blockade of Gaza to Nazi Germany's sieges of Leningrad and Stalingrad during World War II. The dispute recently boiled over after the party proposed adopting a definition of anti-Semitism that differed from the one approved by the International Holocaust Remembrance Alliance. Labour's version omits some of the alliance's language around criticism of Israel. The alliance's definition says it is anti-Semitic to compare contemporary Israeli policies to the policies of the Nazis, a view Labour did not endorse. Corbyn said Labour was consulting with Jewish groups on the party's definition of anti-Semitism. He said it was important to ensure "you can discuss and debate the relations between Israel and Palestine, the future of the peace process and, yes, make criticisms of the actions of the Israeli government in the bombing of Gaza and other places." "But you can never make those criticisms using anti-Semitic language or anti-Semitic intentions, and that is what we are absolutely clear on," Corbyn said.